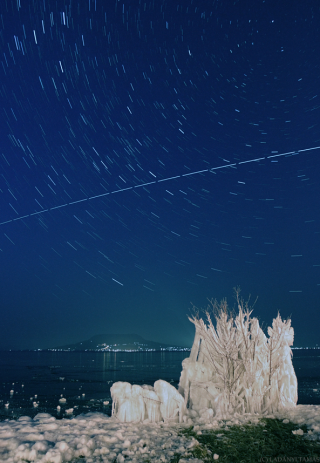 The International Space Station trails over the sky in this image taken in frozen Lake Batalon, Hungary. Skywatcher Tamas Ladanyi of the The World At Night (TWAN) took this photo over the lake on a frozen night in February 2011 during the final flight of space shuttle Discovery. The image creates a single trail when Discovery was docked at the space station. Ladanyi took multiple exposures to create enough light for this image. The background in the night sky is star trails caught in the image. The International Space Station is the largest spacecraft ever built and is currently home to a crew of six astronauts: three Russians, two Americans and one Dutch astronaut. Construction began on the space station in 1998, with major work ending in 2011 when NASA retired its space shuttle fleet after 30 years of service. Each of these websites will ask for a zip code or city, and return a list of suggested spotting times. Predictions are computed a few days ahead of time and are usually accurate within a few minutes. However, these predictions can change due to the slow decay of the space station's orbit and periodic reboosts to higher altitudes, so you should check often for updates. Another great site is this one, which provides real-time satellite tracking and shows you at any given moment during the day or night over what part of the Earth the ISS or shuttle happens to be.